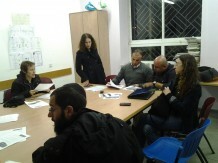 On Februrary 10th, Bimkom along with residents in the working class neighborhood of Kiryat Yovel in Jerusalem will submit its objection to the Municipality’s plan to raze the existing low-density buildings and replace them with high-density towers on Zionism Street. This plan of raze and rebuild, known as pinui-buinui, is a government initiative which seeks to transfer its municipal responsibilities to the private sector. In pinui-binui schemes, and others like it, the replacement of public infrastructure as well as reinforcement against earth quakes and the creation of public bomb shelters is privatized. There are presently some 50 such pinui-binui initiatives on the public agenda. While the government touts these projects as “urban renewal,” in fact they contain no social aspects such as increased access to employment or transportation nor do they take into consideration the need for a social-economic balance and affordable housing opportunities. Architect, Yael Padan, who is Bimkom’s Coordinator for Urbanism and Social Justice, made extraordinary efforts to meet with residents in order to explain the ramifications of such a project. She worked intensively with the residents of Zionism Street in their efforts to object to the plan which would completely destroy the pastoral nature of this old neighborhood and the social ties which have developed over its 60 years of existence.. In addition, The plan, if approved, would completely erase the stunning landscape and nearly all public green space. Bimkom helped residents understand the ramifications of the plan which would replace the existing 6 buildings (each two stories high) with 11 high-rise towers (between 11-15 stories high). In fact, the project calls for -266 new units instead of the existing 64, thereby increasing the density of the street four-fold and drastically changing the character of the neighborhood where many residents have lived their entire lives. Some residents have started calling the initiative “Holy Land, Part II” referring to the colossal Holy Land Towers which are generally regarded as an eye-sore and have come to represent corruption and nepotism. One community resident and activist, Haim H. complained, “With all the money the Municipality has invested in developing this plan, they could have used gold to replace all the public infrastructure. He explained that while the plan jumps through various bureaucratic hoops (which can take up to five years) any development on the street will be halted.” Thus residents will receive no public services such as vital infrastructural repairs. Following Bimkom’s involvement, nearly half of the residents have objected to the plan. That said the objections themselves will probably not be enough to cancel the plan. Bimkom’s next steps will involve preparation of local residents for the upcoming District Committee hearing. Following which, Bimkom will consult with residents who may seek to appeal the decision. If the residents wish, Bimkom will consider helping residents bring the matter to the courts. Bimkom is also working on HaNurit Street in neighboring Ir Ganim and will begin work in other local communities throughout Jerusalem. Our work in communities such this one is part of Bimkom’s overall objective to change the discourse in Israel to one which includes true urban renewal, both in its physical as well as social senses. Bimkom seeks a meaningful answer to the real needs of many of Israel’s urban centers and especially those in vulnerable and peripheral communities.